Black rat snakes exhibit color patterns and behaviors that change over the courses of their lives. Observing these changes is one enjoyable aspect of keeping black rat snakes as pets. The pace of their maturation varies with the husbandry provided, just as habitat particulars including climate affect how long it takes for specimens to mature in the wild. But with proper feeding, a captive 12-inch hatchling generally takes about four years to become a 5-foot adult. Some black rat snakes may exceed 7 feet, but reaching such sizes takes a lifetime, as growth declines after maturation. Black rat snakes live throughout most of the eastern United States, mostly in forests, agricultural areas and suburban settings. Black rat snakes are predators of lizards and frogs as juveniles; they shift to rodents, birds and eggs as adults. This dietary shift occurs along with a change in appearance; hatchlings are predominately grey, with roughly square black splotches dorsally. As they approach adulthood they become darker and darker, eventually becoming predominately black. Even adult black rat snakes are consumed by a variety of predators; red-tailed hawks (Buteo jamaicensis), red-shouldered hawks (Buteo lineatus) and eastern king snakes (Lampropeltis getula getula), will consume black rat snakes. Because of this, snakes who grow and attain large sizes quickly are more likely to survive. This was demonstrated in a study by Gabriel Blouin-Devers et al. 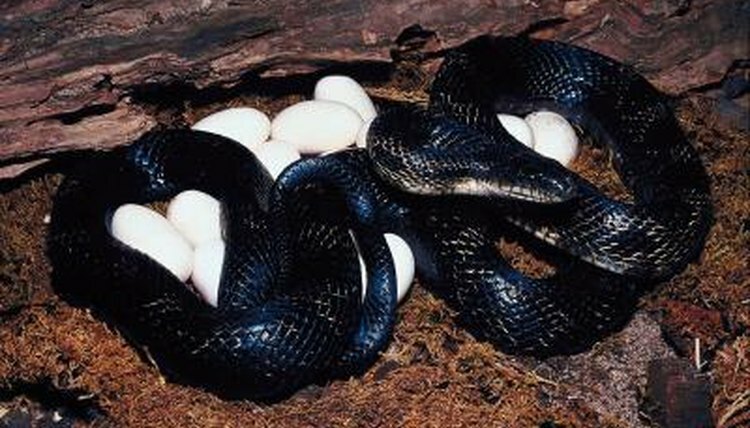 that showed mortality in black rat snakes is highest for hatchlings, steadily dropping with increasing size. Their study, published in a 2002 issue of "Journal of Zoology," documented that most of the largest snakes were males. Male black rat snakes engage in strength-based physical altercations when they encounter other males; larger ones typically win and have more opportunities to breed with females. Large size allows a black rat snake to consume larger prey, further increasing his odds for survival. The main thrust of the study by Blouin-Devers was to compare black rat snakes found in Ontario, Canada, with those in Maryland, USA. As the authors predicted, northern snakes had shorter growing seasons than the Maryland snakes, ergo they took longer to mature. On average, the Maryland population matured in four or five years, whereas individuals from Ontario took almost a decade to mature. Models of the data projected that the Ontario population lives up to 30 years -- much longer than the Maryland population with a projected 20-year life span. The slowest-growing snakes in the study averaged 0.006 inches of growth per day whereas the quickest growing snakes grew about 0.01 inches per day. If you feed your snake a medium-size prey item once per week, he will likely reach about 5 feet in three to four years. Black rat snakes can process food much quicker than once a week if healthy, so you could grow a specimen faster and bigger, for instance by feeding every second or third day provided your snake has ample access to a good basking spot and his health is good. Under prime conditions, skilled keepers can raise some snake species to maturity in about 18 months. Opinions vary regarding the best way to attain maximum growth rate; some feel that specimens fed larger and less-frequent meals grow more quickly than snakes fed the same total quantity of food over time through smaller and more frequent meals. A 2012 study by David A. Penning of the University of Central Missouri refutes this. Penning found that the only difference between snakes fed by the two different strategies was the amount of time spent handling and manipulating the prey, which took much longer for larger prey items.